THE central problem for the people of Darfur and neighbouring Chad is not, as some would have it, that they are suffering from a lack of weaponry or an absence of heavily-armed forces capable of imposing their will. Quite the contrary. In fact, the region suffers from an appalling, lethal surfeit of guns and competing armed groups, all of whom can lay claim to some form of a mandate and some form of questionable authority. In Chad alone there are some three separate rebel groups which sporadically do battle with the rather dubious government of Idris Deby, who himself used force of arms to take control of the presidential palace in N’djamena in 1990. He utilised the ballot box to retain power in 1996 and 2001 but widespread fraud was alleged to have occurred in his last electoral outing. Across the border, in Darfur, there are also several rebel groups battling Khartoum although at least five of the main groups formed a tactical alliance late in 2007. Nonetheless, at least three remain outside that alliance, including the Justice & Equality Movement (JEM), probably the most effective rebel grouping in Darfur. The situation is made rather more fluid and complex by the fact that the armed groups regularly criss-cross the border between Chad and Darfur, either to fight or take refuge. In addition to the insurgent groups, there are the state forces of both Chad and Sudan, along with notorious militias such as the Janjaweed – often translated as “devil on horseback” – which Sudan employs to run a proxy terror campaign in both Darfur and more recently across the border into Chad. This is where the various international forces, deployed or deploying, are supposed to come in. The body charged with peace-keeping in Darfur is Unamid, an African Union/United Nations force that has yet to reach its full complement of 27,000 troops. 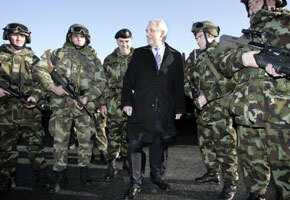 And then there is EUFOR, to which Ireland has contributed troops, along with some 10 other EU countries. This force represents an international first in that it is entirely European in composition but mandated by the United Nations. The government of Nicholas Sarkozy was arguably the driving force behind the creation of EUFOR and will contribute the greatest number of troops. Such is the French zeal that when EUFOR struggled to fill its ranks earlier this year and threatened to collapse, Paris immediately increased its contribution to ensure that the mission did not expire for want of either materiel or manpower. But French military involvement neither begins nor ends there. Although Chad gained independence in 1980, the country has been a favoured ally and protégé of Paris for many years. France currently has some 2,000 French troops stationed there. Ostensibly, they are there in an’advisory and support’ capacity – precisely the same language used to explain away the early US military presence in Vietnam. But there is little doubt that their key role is to maintain the regime of Idris Deby. When rebels threatened in 2005, the French provided critical intelligence and air support. Similar allegations surfaced following another near-successful attack on N’djamena in February of this year. As the assault threatened Deby’s presidential palace, any lingering doubts about French impartiality on this issue were quickly dispelled by French Foreign Minister Herve Morin, who declared that Deby is “an exceptional fighter, a man with courage who has at least 2,000 to 3,000 men under his command”. Hardly surprising that rebel groups in Chad have already declared a “state of belligerence” with France and, for a time, threatened hostility to all other foreign forces, including EUFOR. However, that threat appears to have been lifted. For now at least. However, there is no denying that the murky French role in Chad has, at least, cast a shadow on the EUFOR mission. And this shadow may lengthen depending on the unfolding of events in this very troubled region. Rebel forces have now launched a renewed assault on Deby’s regime. Should they succeed, it is certain French troops will either leave or be expelled. What becomes of the French contingent attached to EUFOR? Might they get drawn into the fighting, dragging the rest of the force down with them? The roots of the conflict in Chad are to be found in neighbouring Darfur. Indeed, Idris Deby launched his own military campaign for the presidency of Chad from Darfur in 1989. When the current conflict between Khartoum and Darfuri separatists erupted in 2003, the main rebel grouping was led by a Chadian known as Abbaka. He was from the Zaghawa, a semi-nomadic grouping that inhabits the border area between Chad and Darfur. Fearful for the stability of his own regime, Idris Deby initially assisted Khartoum in suppressing – quite brutally – the Darfuri uprising. However, the policy backfired when the Zaghawa contingent in the Chadian Army revolted in May 2005. Deby was forced to perform a volte face and thus began his ongoing support and assistance for the Darfuri rebels, a policy which continues to this day. Naturally, Khartoum retaliated with support for Chadian rebel groups and both governments are now effectively fighting proxy wars with each other. In May, Darfur’s Justice and Equality Movement (JEM) launched a surprise attack on Khartoum. Many suspect this was at least partially inspired by the Deby regime in revenge for the February assault on N’djamena. The leader of the JEM, Khalil Ibrahim, is also a member of the Zaghawa ethnic grouping. In the midst of this hellish, all-embracing battle zone is the civilian population. Already some 300,000 people have lost their lives and up to two million people have been driven from their homes in both Darfur and Chad. It is without doubt the single most urgent and appalling humanitarian crisis in the world today. And into this already complex mix has been introduced the spectre of oil. Chad has been exporting oil since 2003, with that commodity overtaking cotton as its biggest export in 2006. Large corporations have invested in the country. Deby, meanwhile, has been diverting oil revenues from development to guns, resulting in the World Bank shutting down aid projects in the country. In neighbouring Sudan, an equally odious regime is aware that its vast reserves of oil give it leverage and licence. While Chad has faced West, Sudan has been promised some $10 billion in investment from China, which currently purchases 30 per cent of its oil needs from the country and provides political cover on the UN Security Council. A new Cold War over oil is beginning to take shape in Africa and the international powers are hovering. Chad and Darfur are possible portents of what lies in store. That is not a comforting thought.